Is there any way I can see what this screen looks like? In this new version, is there any way to be able to put a link to our Course Catalog (pdf) document on the class registration screen? The Class Registration screen looks exactly like it does stock. You can add a link to you course page simply by editing the guardian\requestform.html page. I just installed EPP. All the extra screens are great however the Demo Update icon is not showing on the Parent screen. I have checked the school and district Parent Portal Settings to make sure they are unchecked. I can see the icon and page in the custom folders. I have tried it with SSO enabled and without. Is there a setting somewhere that I have missed? You will need to enable the setting on the student level as well as per the documentation. I apologize. I missed the documentation during the site move. You can now download the documentation. Thanks for your work on this. However, I'm not finding where to setup this up for students. When logged in as a parent, they cannot see Demo Update even though the option is unchecked. All I find in the documentation (page 15) - "*Additional controls are available for the Demographics update page. One can set an entire school to have access to that page, but then has the ability to remove that page from individual students at the school. This level of control can be used with separated families or in other unique situations that may warrant it." Where are these additional controls? Hi, we have the same problem here. Demo Update icon not being displayed in EPP. I am seeing there are some reports of the same problem but not a clear answer yet. I reviewed the current documentation available and I found exactly the same paragraph John Swaney mentioned above. Any guidance from anybody in PowerData Solutions would be much appreciated. Hi, I just installed EPP and am having the same issue of the demo update icon not showing up. I am not sure what to do. This is the one feature that I really want. On the Custom Student Screens page I do not see any new screens, just the ones I already had. PowerSchool hosts my server and I'm not running database extensions yet. Any help would be appreciated. I do happen to notice that the Demographic Change icon is not shown on the screen shots on pages 1, 16, and 17 of the documentation either. An update to my previous post: I reset the server and now the Parent Demographic Change custom screen shows up on the admin side and I can get the Demographic Change icon to show up for a student on the parent side by marking the "If this box is checked, any guardian can see demographics data..." checkbox. After doing this, I see the new custom field enabledemoupdate with a value of 1 in DDE for this student. I am still testing, but hope I can set the value of this field for all students using Student Field Value. After we did an upgrade I lost all of the enhancements. When I reinstalled in enhanced parent portal files, the parent demographic does not show up in the custom screens. It appears that all of the files are there. Where do we go specifically to enable the setting on the student level? I am not seeing this anywhere. The icon seems to be showing up on some of our parent screens but not on others. Same here-I reinstalled and restarted report works. I checked all settings and everything looks ok. What am I missing ? Thanks for the updated version 3.3! 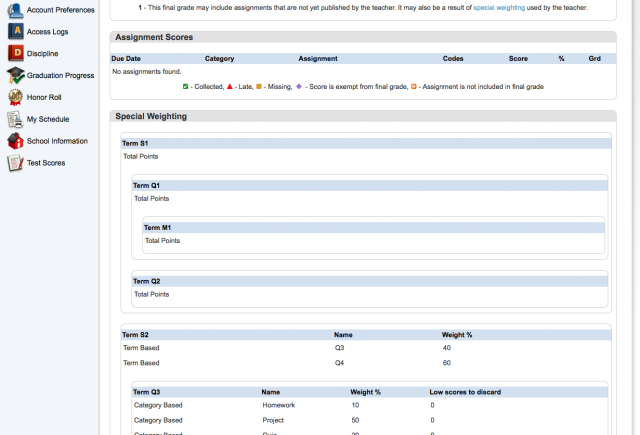 In testing this we found that the Grades Last Updated On field only gets updated when the teacher records a traditional score in the assignment column. Our teachers ONLY enter a standards score in the standards tray and that doesn't get reflected in the parent portal under Grades Last Updated. Page = scores.html. It looks like it's using a field ~(LastGradeUpdate) with some logic. Is this something that is easily fixed? Thanks! I would suggest making a enhancement request on PowerSource. The cc.lastgradeupdate field should really be changed to reflect entry of assignment standards scores. Thanks Brian. I added a support case first, but expect it will be turned into an enhancement request. In the mean time parents are calling teachers and admins. I guess it will be a "education" issue. You could remove that tag and just not even list it on the page. As expected, I was told to submit an enhancement request. Please vote for enhancement id 3034 :) so the Grades Last Updated will reflect both traditional and standards scores. Thanks! Brian -- can you help?! this EPP 5.0.2 is displaying my % on the parent portal instead of the dash (–) for the numerical grade. How do I hide the % on the historical grade tab? When you print the Quick Lookup/Scores (scores.html) page using the PS print icon, any section description that was copied into the gradebook appears as a single line and does not get wrapped appropriately. This also happens on the stock Quick Lookup/Scores page (scores.html). At PSU Orlando, Jason thought he might have a fix to this. Thanks. Similar to this post from 2 years ago, we notice the same behavior on the teacher comments screen. Does anyone have a fix for this issue? Could I upload the files to powerschool through the Custom Page Management system under PS Administrator? Yes, anything marked CPM Import Friendly = Y can be imported directly. Images/Binary files will need to be uploaded individually due to a CPM flaw. So I would just click Import/Export button and the select the unzipped folder. Then go back in put in the pictures and binary files correct? NM, I figured it out. Just import the zip file. Hi there - the documentation for EPP provides a link - www.powerdatasolutions.org/content/customization-basics. I cannot seem to find this. I was at PSU last week and took both courses - The Foundations of Customization and Introduction of Powerschool Customization, but wanted to have a look at the documentation here as well. Any suggestions? Thank you! We just upgraded to 7.1.2 last night and found that our Class Registration screen shows the "wait while the page renders" issue. We do have an image server but I've copied over both the stock and custom scripts and images folders several times now to no avail. I've got the most recent Enhanced Parent Portal customization on...do you have any suggestions for where I can look next? Thank you! Thought I'd put some updated information out there in case someone might be able to help...we are really stuck! When we did our upgrade, we had issues because our SIF server was left running during the upgrade. Before Pearson support discovered that was the cause of our upgrade problem, they had gone in and "truncated the ps.server_config and ps.server_instance files...I'm wondering if something with that would cause this issue? Does it work with customization off? If it doesn't then it's a PowerSchool issue, if not it's EPP. Downloading the entire zip file. Is there a way to add the entire zip file and/or do you need to load the files separately. Re: Downloading the entire zip file. Thank you, Brian. I appreciate your help and patience. So very helpful! I'm new here ... hoping someone may provide some help. Recently upgraded to PS 7.x.x.x Still working out a few small bugs. Can't figure out why my menu pane in Student Selection view is being displayed like my old version of PS. Any thoughts would be appreciated. Thanks. That would be from a PS 6 version of the \admin\students\more2.html file. Thank you , Brian. Can I just import that page ? p.s. William Parrott at PS is a big fan of yours. You would need to extract the file from the zip and rename and then upload that file. We didn't keep it names more2.html because we didn't want to overwrite someones customized version. Have you ever thought about going on the road? You guys are so great! Thank you for the documentation on uploading zip files, etc. I am trying to upload the EPP zip file, but the file does unzip when trying to do so. What am I missing? I am embarassed to put this out there - YIKES! Once again - thank you. I am wondering if anyone uses the EPP for re-enrollment for the next school year? We have a custom screen that we currently use, that we want the input from the re-enrollment process from the parent portal to flow through to. Any thoughts on this from anyone? Thank you. The demographics change page can serve as a template to do something like that. If you aren't comfortable doing it yourself let me know but in general you can follow how that page works and do what you are looking for by expanding on it. Sorry, Jason, I did not even see this reply to my inquiry - thanks so much. I would appreciate some help to make this happen - just when you have the time. Thanks so much. I have created a custom screen - quite an easy task for sure, but have not been successful with the custom page. I am learning thanks to you guys!! Hi, It seems like something is blocking the demographics area of the epp from showing. How do I go about finding out what it is? Hi Everyone - I have sent this off a few times, but am thinking that there may not be anyone who has the re-enrollment process available on their parent portal. Does anyone (Brian, Jason) know how to make this happen and/or what the scenario and/or coding might look like? Thanks. Hi All - just looking at the demographic information that is showing on EPP - it is a bit jumbled and the phone number, etc. is not correct. Thoughts on this?